At Elite Electric Inc. we have years of experience customizing homes and offices to fit your needs. From adding a receptacle (wall plug) to accommodate a new appliance, or putting in a switch for that old pull chain light in the basement, to complete wiring of your new home or business. From adding new recessed ceiling lights to replace that corner lamp, to installing a ceiling fan to help lower your heating and cooling costs. Wiring a Central Air Conditioner, or a new hot tub, installing a bath vent or whole house vent. Elite Electric does it all! You can be confident knowing you have Elite Electric working with you! Elite Electric Inc. can customize your home or office to fit your needs. 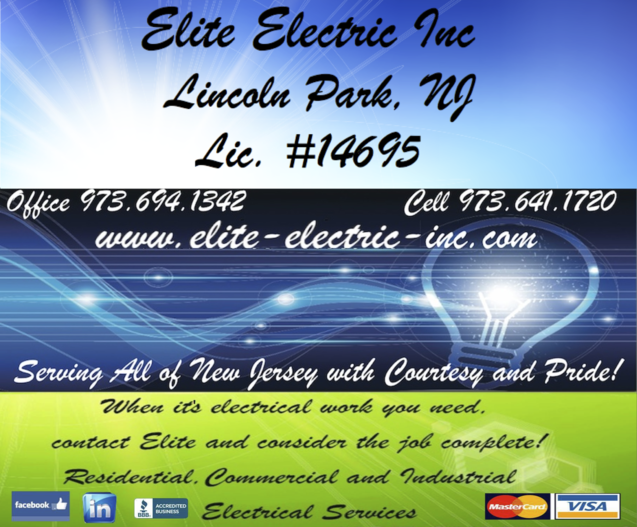 Safety always comes first with Elite Electric Inc.!